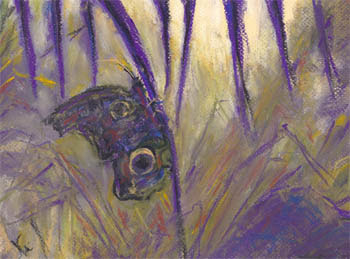 Here is another butterfly pastel, on Canson Mi-Teintes paper and with a little darker feel to it than the last one. 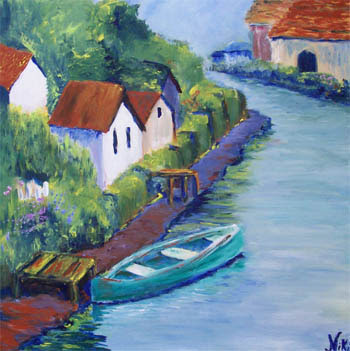 I normally paint in a bright and sunny fashion, as I happen to agree with Renoir's famous stance on ugliness in art: there's enough ugliness in the world, so why not paint beauty instead? Ocassionally, however, a less cheerful mood will overtake some of my work. 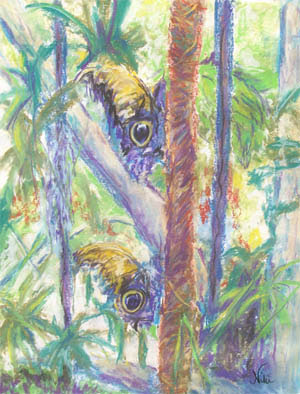 In this case, the colors came out fairly dark, and the butterfly took on the appearance of clinging to the foliage rather than hanging delicately as it was in my reference photo. The surrounding plants appear to part ways, as though a wind is sweeping through the area and leaving the butterfly to hang on desperately until it passes. There is light in the background, suggesting that the dark wind will pass and the warm light will take over. I recently attended a wonderful recital in Temecula, California. The Polynesian dances were so inspiring, I took a bunch of photos from afar just to have a reminder of the poses and costumes. Each piece in this series has a different focus and features a different girl. In "Seated Pose," I wanted to focus on the position of the dancer's body. In the "Dancer," I hoped to capture a bit of movement, although this dancer happened to be standing still in the photo. "Hula Girl" was inspired by curviness of the dancer's body, and the graceful way she held herself in position. 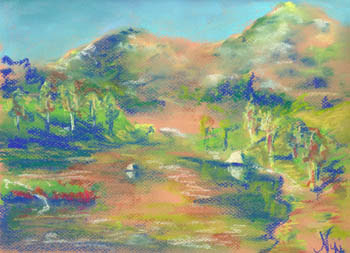 When most people think of chalk pastel, they don't think of brushes and water. 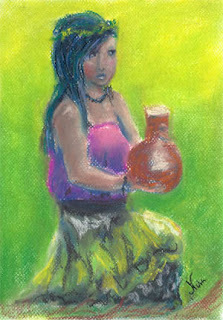 Chalk pastel is in fact quite water soluble, if you know work carefully and adjust for the dust. A couple of totally different painting experiences, both at home: one so relaxing I could barely keep my eyes open, the other so frustrating I had to take frequent time-outs. I firmly believe that it is to my benefit as an artist to be able to drop everything and work on a painting or drawing, no matter where I am. Gone are the days where the combination of timing, inspiration, and availability of materials all had to come together in order for me to spend some time making art. I now know that waiting for those moments to come would mean never getting any work done at all, so I took a strategy from my writing days instead: be prepared to paint at any free moment, and put some time in each day. Painting at home should give me plenty of opportunity for this, right? Well, there's definitely opportunity...it just takes a cool head and a persistent hand to make the most of it. In your average harbor, the water isn't the cleanest-looking. Neither are the birds. When the sun hits everything just right, rich colors still come through...and then there's always my favorite option: exaggerate. The seagull above wasn't the most colorful bird, and the rocks and water were also a bit dull at first glance. Adding teal and orange as the basic color scheme livened it up a little, and still kept the harbor tones in the painting. 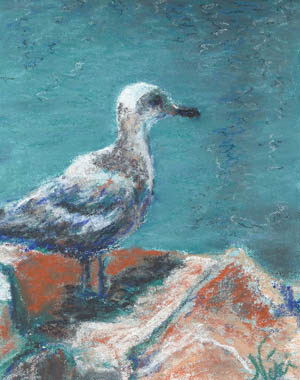 I know you won't find much orange (and definitely not any teal) on a seagull, but it makes for a more interesting painting to take a few artistic liberties with color to please the eye. It's another one of those views from the tram at the Safari Park, which is in San Diego County. Once you leave the coast, much of San Diego county looks like the above painting. It's been unbearably hot these last few days. Sometimes the heat inspires me to paint cooler places like the beach; according to the weather channel website, it's even hotter down at the coast than it is here today. For this painting, I worked quickly, having already formed the idea based on a reference photo ahead of time. The simple composition and emphasis on color (especially the orange paper) were the main components.